It seems, in an attempt to defend and back up currency, there is a race on as to who can own the most gold. Currently the USA owns the most gold with over 1800 tones, but Switzerland owns the most gold per person with a staggering 1040 tones per citizen! On a per person basis the USA is right down at number 9 below such countries as Lebanon, Portugal, Austria and others with only 8,134 tones per person. Of course this is somewhat of a misnomer as the population do not own the gold and most of it is that which is held in banks either by the governments concerned or as a holding for others. But there are indicators that the accumulation of gold, once considered passé, is now considered in a much more serious vein. China and Russia are now hell bent on accumulating more gold in their coffers. One analyst believes China may use a third of their $3 trillion in foreign reserves to purchase gold to back up the Yuan. 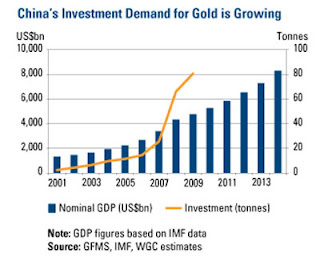 China currently has 1.6 percent of its reserves in gold and is considering investing more than $1 trillion in gold bullion. Michael Pento of Euro Pacific Capital stated. "China wants to be an international player, and they need to own more gold than they currently have." he continued, "China is out to have more gold than America, and Russia is aspiring to the same,"
According to Robert McEwen, chief executive officer of producer U.S. Gold Corp in a recent interview in New York. "When you have debt, you don’t have a lot of flexibility. China wants to show its currency has more backing than the U.S."
And Century Weekly recently reported, "...China, with more than $3 trillion in foreign-currency reserves, plans to set up new funds to invest in precious metals." Russia has purchased eight tones of gold bullion in the first quarter of this year. "This is a big reason gold and silver are headed higher. Occasional dips are inevitable, of course. When they happen bears will declare the bubble popped (after a one-week correction). "Then the uptrend will continue, intact. And they'll say, "bubble, bubble bubble bubble bubble, bubble! ", again. "And gold bugs will be laughing all the way to the vault. "That's how I see it, anyway. Could be wrong, it's happened before. 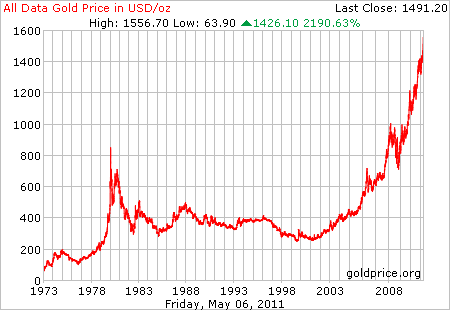 But, I did say the same thing when gold was $1140 in Why I'm Buying the Gold Dips in December 2009." Now Steve Forbes, founder of Forbes Magazine, states although it may seem crazy today, a return to the gold standard is likely in America. Steve Forbes, the founder of one of the nation's premier economic magazines and onetime GOP presidential contender, says he believes the nation will return to the gold standard within five years because doing so would solve a number of economic, fiscal and monetary issues. "What seems astonishing today could become conventional wisdom in a short period of time," Forbes said in an interview with Human Events magazine, a conservative publication. According to Forbes, returning to the gold standard would mean stabilizing the U.S. dollar, restoring foreign confidence among foreign investors in U.S. government bonds and dissuade lawmakers from engaging in reckless spending habits. If the standard had remained in place, Forbes said, the dollar would not be under assault now and federal spending would have been curbed. "When it comes to exchange rates and monetary policy, people often don’t grasp” what is at stake for the economy, he said. "If the dollar was as good as gold, other countries would want to buy it." So there you have it. Could a return to the gold standard be the US's only defence against a massive gold buy from the eastern and Asian blocks? It certainly does look like the Q's are working to impelling China and Russian to buy more gold bullion in their own defence. With all the fluctuations in the gold price one can sometimes wonder when to buy gold and when to sell gold. 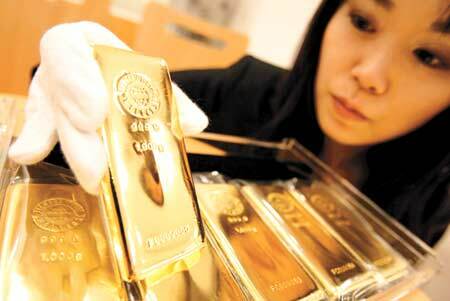 Many factors influence the gold price. The change in value of the currency against which the gold price is set. Forward hedging by gold mining companies to protect their gold sales, massive buying and selling by institutions, as well as other variables can all affect the price of gold. In any trading situation for every sale there is a buyer and a seller. If the price is falling and people are selling gold like crazy, what is sometimes over overlooked is, who is buying at those lower prices? When there is a big fall in the stock market, the price do not just ‘go down’ as is implied in the media. For every sale there is a buyer. A person who thinks it is worth while buying a falling stock or share. The same principles apply with buying gold as they do with any other share, stock or commodity. So when does one buy gold? Warren Buffett (arguably the world’s best investor and 2nd wealthiest man) once said, "Most people get interested in stocks when everyone else is. The time to get interested is when no one else is. You can't buy what is popular and do well". This is what the buyers of falling stocks, shares and commodities understand. While everyone is frantically selling in a sort of ‘group think’ or agreement, the buyers with the smarts move in to buy up cheap, understanding that the market for those stocks, share or commodities will eventually rise again. Of course, with stocks and shares this might be considered a bit of a gamble. But with gold, ah, this is somewhat different. Gold is not just any commodity. It is also money. Gold does not get used up like silver or agricultural commodities. All the gold in the world is still there. It is just moved around or is stored. Gold is used as storage of wealth and as a replacement for currency when the confidence in currency is wavering. It is used, not just to buy and sell. In Addition gold has continued to increase in value over the past 20 years or more. There have been peaks and valleys and regular drops, but even with the drops it has always like a phoenix, risen again to newer and more spectacular heights. A major part of the reason is probably the falling value of currency. As the currency drops in value it takes more of it to purchase the same over a time period. If one separates value from currency this is easily seen. One year it takes 10 dollars to buy item x. A year later it takes 12 dollars to buy the same item. 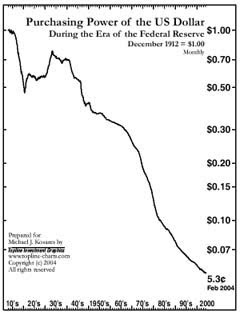 Over the past 100 years the dollars has dropped in value to around five percent. What you could buy for 5 dollars a hundred years ago now costs 100 dollars. Yet this is not the case with gold. Once ounce of gold still purchases exactly the same quantity or goods or quality of services as it did one hundred years ago. Other factors such as short selling, hedging, and the periodic Asian demand for example, all affect the price to some degree. So although gold may fall occasionally it cannot help but eventually rise. So the time to buy gold is very much anytime. When is a good time to sell gold? That really depends on the purposes for which you are holding gold and your individual circumstances. One of the purposes for holding gold is to retain your asset value. Of course a time may come when you may need to utilise some of your asset at which point you sell some gold. Selling gold does not have to depend on the price of gold. Only on the use to which one puts the asset. A falling or rising 'price' of gold is not a reason for selling gold. Only the utilisation of the asset contained therein for a purpose. Buying gold can be done any time. That also does not depend on the price of gold. It only depends on the ability to buy and retain gold as an asset. One can buy large amounts or small amounts on a regular basis. It is the steady accumulation of gold that increases ones asset, not waiting for gold to 'come down' in order to buy it. The upward trends of gold are far greater than the downward trends so, in the long term, anytime is a good time to buy gold.